Please note: All landfill customers must wear a reflective safety vest to enter the landfill. If they do not have one, we will have safety vests for sale for $5 at the gate entrance. Also, no children under the age of 14 are allowed entry to the landfill. The Sprint Fort Bend County Landfill is a type IV construction and demolition landfill located in Richmond, Texas. In addition to serving customers of Sprint Waste Services and the Sprint family of companies, the landfill is open to the public. Since opening in 1982, the landfill has been managed with the highest safety and environmental standards while operating within all state and federal guidelines. At current volumes, the landfill has 40-plus years of life remaining. Read our frequently asked questions below for more information. When is the landfill open for business? The landfill’s hours are 7 a.m. to 5 p.m. Monday through Friday and 7 a.m. to 1 p.m. Saturday. The landfill is closed on Sundays and most major holidays. What materials are accepted at the landfill? The landfill accepts most bulk construction and demolition materials, including wood, lumber, trees, wire, dirt, concrete, bricks, plastic, metals, green waste, roofing materials, furniture, cloth linen material and appliances with Freon removed. What materials are not accepted at the landfill? The landfill does not accept household trash or hazardous waste, including medical waste, liquids, sludge, paints, whole tires, batteries, drums and asbestos-containing materials. How much does it cost to use the landfill? Our rates are based on volume. The minimum charge is $44 with a 4-yard minimum, which covers the first 4 cubic yards of waste. Each cubic yard over the minimum is $11 per cubic yard. For reference, a pickup truck bed filled with trash that is piled no higher than the top of the truck’s cab is considered 4 cubic yards. The equation for estimating your trash’s cubic yardage = (length in feet x width in feet x height in feet) divided by 27. The scale attendant on duty will determine actual measurement and cost. What types of payments does the landfill accept? We accept cash or check only--no credit or debit cards. Commercial customers have the option of applying for a credit account. What if I need help to unload my trash? Normally the landfill does not provide assistance with unloading. However, additional rental products and services can be arranged through our central dispatcher at 281-491-7775. How can I report illegal dumping? Illegal dumping is a crime that is taken seriously in Fort Bend County and throughout Texas and the Gulf Coast. Learn more about illegal dumping in Fort Bend County here. 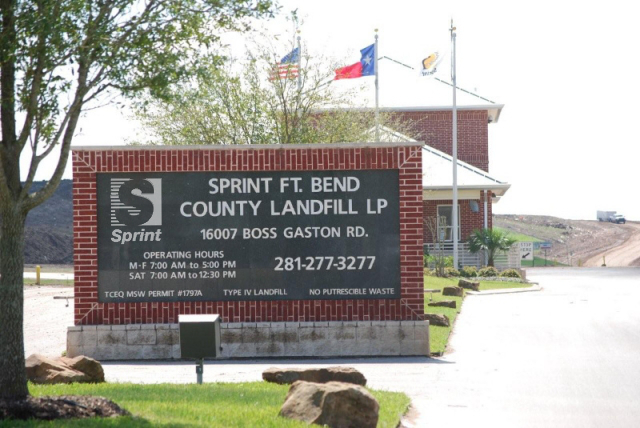 Where is the Sprint Fort Bend County Landfill located? The Sprint Fort Bend County Landfill is located at 16007 West Belfort Ave., Sugar Land, Texas 77498 off of Highway 6 and Old Richmond Road. Directions from I-10: Take Hwy 6 south to Belfort Road. Turn right. Go to the first stop sign. Stay straight on Belfort Road. The landfill is about a quarter of a mile down on the left-hand side of the road.